So I have made the trek to the other side of the Atlantic and this comes with the price of no sleep for 30 hours and a mixture of not wanting to sleep and the need to sleep for 20 hours at the same time. I can't decide if I should sleep or if I should stay up all day and not go to bed until as late as possible. So while I am trying to come up with a suitable solution I have been shopping online. I have no idea why I think the right thing to do is to shop on the internet during these times as I usually end up spending money on things I don't really need, but would be super cool. This all started with me at the airport having severe bag envy when I saw a to die for bag at LAX. It took a lot of will power not to beg them to trade me for my worn out but highly noticeable pink hard case luggage. Somehow I just know they would have declined my offer. Anyway I haven't been able to stop thinking about this luggage. I know I saw these in a magazine once or twice, but didn't pay much attention to it as my pink and noticeable luggage was quite new. Now as mentioned prior it is a little worn (by little I mean a lot) so new luggage is on the mind. Here is a stylized photo of what I saw. I know, right? I totally want and would love these forever. It's like old world charm and modern functionality. Oh and did I say it comes in pink? No? Well it does. AWESOME! 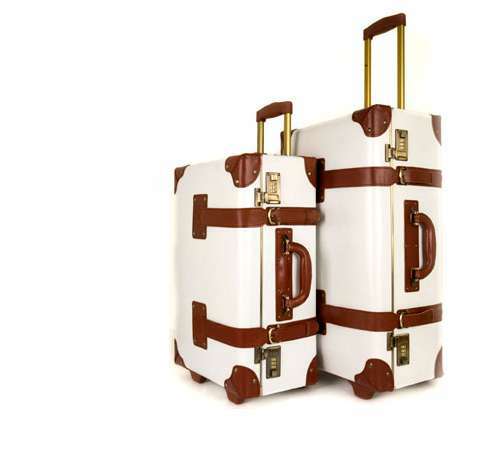 This is from SteamLine Luggage and comes in all sorts of colors and styles, but I had better luck getting exactly what I wanted at Neiman Marcus. Expensive yes, worth the price? We will see.